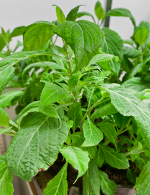 Salvia divonorum is a very unique member of the Lamiaceae (Labiatae) family, which includes such plants as sages, mints, and basil. It is endemic to the Sierra Mazateca in the state of Oaxaca in Mexico, growing in the primary or secondary cloud forest and tropical evergreen forest at elevations from 300 to 1,830 metres (980 to 6,000 ft). S. divinorum is one of several species that are ritually used by Mazatec shamans. The major active compound of S. divinorum is the neoclerodane diterpenoid salvinorin A. Salvinorin A is a potent and exclusive κ-opioid receptor (KOR) agonist, meaning that it works with and produces a functional response solely in the KOR. It shows great promise in treating the symptoms of a number of illnesses where hallucinations are part of the disease symptoms, such as schizophrenia and severe bipolar disorder. Closely related compounds, salvinorin B, salvinorin C, salvinorin D, salvinorin E, salvinorin F, divinatorin A, divinatorin B, divinatorin C and (±)-hardwickiic acid also occur in S. divinorum. All of divinatorin and salvinorin compounds are synthesized exclusively in S. divinorum peltate glandular trichomes. Although previous research indicates that salvinorin A is produced through the MEP/DOXP pathway, the subsequent pathway leading from GGPP to salvinorin A remains unclear. We are interested in discovering and characterizing enzymes involved in GGPP cyclization and salvinorin compound modifications and in elucidating the means by which such enzymes have evolved in this very unique and interesting plant.